BANGI, 8 November 2014 – The Chancellor of The National University of Malaysia (UKM) Tuanku Muhriz Tuanku Munawir was today conferred an Honorary Fellow from Aberystwyth University (AU) in Wales as recognition for his wide experience in Public Affairs, the Corporate sector and dedication as Head of a State here today. 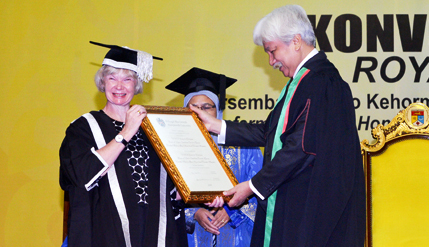 The acceptance ceremony was held in UKM and the award is conferred to Tuanku Muhriz by the Vice Chancellor of AU Professor Dr April Mcmohan. Dr Mamohan said the Honorary Fellowship is an unusual one which only a few Universities in the United Kingdom gives out for the highest distinction. This is the first time that the award ceremony is held outside of AU since its establishment in 1872. Tuanku Muhriz is an Alumni of AU and the Royal Patron of AU Malaysian Alumni Club. He had studied law graduating with LLB honours in 1970. In his acceptance speech Tuanku Muhriz said while at AU he learnt important principles of law based on the rule of natural justice which is rooted in a wider concept of morality. He said it is everyone’s duty to teach about justice and morality. He narrated a story that he heard from a Friday sermon about corruption. A person has to be honest when confronted with issues of conflict of interest and they should act fairly. This includes rejecting any gifts or favours no matter how small or innocent as that may affect their decisions. Tuanku Muhriz who is the Yang Di Pertuan Besar of Negeri Sembilan, had previously received an Honorary Doctorate from University of South Wales, formerly the University of Glamorgan. Present at the ceremony was Tunku Ampuan Besar Negeri Sembilan Tengku Aishah Rohani Tengku Besar Mahmud, UKM Vice Chancellor Professor Datuk Dr Noor Azlan Ghazali and a delegation from AU. Tan Sri Abdul Wahid Omar, Chairman of the New UKM Board of Directors. This site can be accessed using smart devices. Best viewed using the latest versions of web browsers on a minimum resolution of 1024x768. For further explanation can be read here.